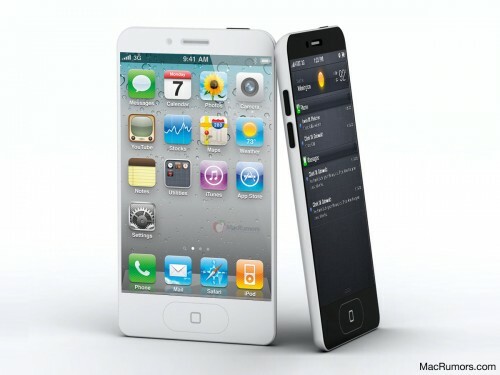 Yesterday, Apple released their next generation iPhone called the iPhone 4S. Some were understandably disappointed that the rumored tapered "iPhone 5" design (shown below) was not released. The design was first revealed back in April, but gained more traction after cases started appearing from various Chinese accessory manufacturers in June. In fact, we heard that many of these suppliers were 100% confident that this would be the new iPhone design. So much so that large distributors were offering money back guarantees to retailers that these cases were correct. This, of course, led to a proliferation of cases into retailers as well. As the media event approached, however, there was no real evidence that Apple was actually producing this design. One report suggested that a lost Apple prototype from a Foxconn factory was the source of the case designs. This is a story we're inclined to believe. We had heard that this design is an actual Apple prototype that was in development, and not just a product of someone's wild imagination. So, there is some hope that we will ultimately see the design in the future, though it's also possible that this exact design will never make its way to production. This scenario has happened before, where case makers jump the gun based on a leaked prototype. Most notably, back in 2009, case makers started producing cases for a then-unreleased iPod touch with camera. A prototype of exactly such a device was also leaked. Apple, however, released a camera-less iPod touch in 2009, and waited until 2010 to release one with a further redesigned camera. So that 2009 prototype never made it into production, but was verified to be legitimate. The "iPhone 5" moniker will also have to wait until the next iPhone's release. At this point, Apple seems to have established a pattern for their iPhone releases with external design changes seemingly scheduled every two generations (Original iPhone, 3G, 3GS, 4, 4S). We've heard nothing about when the next generation iPhone will arrive, but if we had to guess, we'd think Apple would stick to a late fall schedule again in 2012. I don't know if Apple will face a blow because of a '4S' or not. All I am disappointed with is a new form factor. But apart from that, everything else is just so godamn awesome. I think all these blogs/rumour sites and all of us were responsible for our own discontentment. Apple is not. Apple may have taken a longer time for this new iPhone but delays happen; and its not the first time Apple has changed the duration or start-time of their product cycle. We received the new Macbook Airs just recently. They were supposed to be release in September - November but were released in the June-July time frame. So did the MacbookPros, etc. Apple has done a lot of work in the last few quarters: iOS 5, iCloud, iPad, MacMinis, MacbookPros, iMacs, MacbookAirs, etc. I think we were expecting too much out of Apple this time. As others have said, changing an already powerful and awesome design just for the sake of it is bad product development, engineering and foresight. iPhone4 is a great phone and still beats the **** out of recent Android and WindowsPhones. I think if people look beyond a new form factor, they could see something great about this new iPhone. Don't like it? DON'T BUY IT. I'll be using one soon. MR and many other sites just overblown this silly rumor and people just had high expectations of something that would never happen in the first place. I would expect the next iPhone to be called iPhone 6. If history is a guide. One thing for sure, if that design with a 4" screen ever does get released it will be the worlds best selling phone. New phone is awesome if new phone is awesome. Still the same old janky carrier plans and contracts though. Let's face it, Apple doesn't want to be in the position where consumers expect them to fundamentally redesign the phone every year. That's a lot of work for a design that doesn't last that long at the high end. Plus, each redesign means it's harder to top yourself the next time around. Just look at how the iPod Classic line has stagnated so much over the years to the point it's not even mentioned during keynotes anymore. Apple has already proven that there's such a thing as overdesign when they created the 3rd generation Shuffle. It had no buttons and could only be controlled via voice, frustrating users. It was hated so badly that the 4th generation was basically a 2nd generation Shuffle with new colors. The actual design of the hardware can only change so much. For example, I don't think we'll ever see any more significant camera updates in new iPhones worth talking about. What would be better than 8MP stills/1080p video recording that would be reasonable to stick into a phone? The future of the iPhone platform is iOS itself because that's where real innovation can happen for several years to come. Lastly, I want to point out this MacRumors (https://www.macrumors.com/2011/01/05/next-generation-iphone-parts-caught-on-video/) story from January. If you remember the video, the steel frame is exactly what's used in the iPhone 4S with the same positioning of the antenna separators as well as a micro SIM card slot (something the Verizon iPhone doesn't have). That would indicate that the final design of the iPhone 4S was ready at least 9 months ago. If so, the leaked "iPhone 5 designs" were likely very early prototypes of next year's hardware design. If such a design leaked a year before release, it would really get Apple into a tizzy because there would be ample amount of time to copy the design before its release (thus Apple has involved the SF Police and gone to great length to go find it ASAP). You have to admit that looking back, this scenario makes a LOT of sense.